The 1st of May is the international day of struggle of the working class. 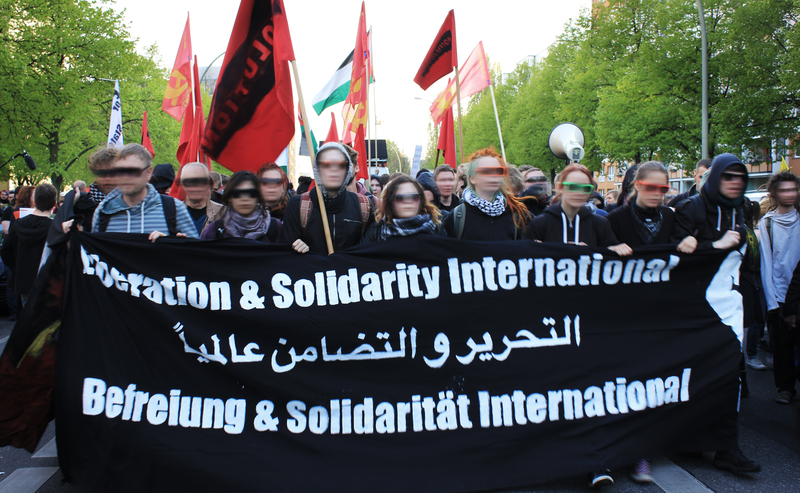 We are here in the internationalist block since we know that the global liberation of the working class is not possible without the international solidarity with liberation struggles against oppression. In this regard is Palestine a case study. The colonisation of Palestine by Zionism has started decades prior to the second world war. The zionist migrants which came at the beginning of the 20th century to Palestine developed an ideology for the colonisation of the land – “Kibush Ha´avoda”, occupation of the labour. According to this ideology the work in itself in Palestine should be taken over by Zionism, the local Palestinian labour should be replaced by what Zionism called “Hebrew Labour”. This concept was followed using different means: through the buying of Palestinian land, through denying, also violently, Palestinian workers from taking part in the work process, or by bringing jewish workers from muslim countries, thinking that as non-european they can work better, and are still not Palestinians. Through those measures the Palestinian proletariat was almost completely ousted from the capitalist system in Palestine by the twenties and thirties. This fact has not only immensely weakened the Palestinian population and gave Zionism an upper hand in the negotiations with the British colonialism, but it has also prevented the development of a Palestinian class society, which is a precondition for political organizing. The divide and conquer strategy of Zionism was already applied back then on to the class structure of the Palestinian population. Despite all of that, the Palestinian people resisted, as with the general strike of 1936, and it is resisting until today. Therefore, the Palestinian working class is waging a double struggle for about a hundred years: against its capitalist oppressors and at the same time against the occupation, which oppresses it for its nationality and ethnicity and so prevents it from developing as a class. The jewish-Israeli working class as occupier is also waging a double struggle: against the class which exploits it, as well as against the attempts of liberation by the Palestinians. In the last decades the jewish-Israeli proletariat has consistently favoured the second struggle. The nationalism of Zionism has prevented the emergence of a revolutionary class consciousness in the Israeli society as well. There the proletariat does not see itself as a class, but as part of a national collective. It develops its identity not as a reaction to its exploitation by the capitalist class, but rather as a reaction to the non-jewish people in the country. There can be no class struggle in Zionism, since the class struggle can never have the internationalist element, and since every class struggle would always be secondary to the nationalist identity. A class struggle in Palestine is only possible in a society without Zionism. This is another example for the famous sentence from Engels: “A people, which oppresses others, can not emancipate itself. The force needed for the oppression of others will be used at the end against it itself”. As long as the jewish-Israeli proletariat continues to support occupation, militarism and chauvinism, it will never be able to develop the revolutionary consciousness needed to wage an internationalist struggle together with the Palestinian working class. Nevertheless, and exactly for those reasons, the jewish-Israeli proletariat has the responsibility, as all other classes of the society as well, to fight against the occupation. Its oppression as a class does not eliminate its role as occupier. Whoever cannot see the capitalist-colonial aspects of the situation in Palestine is forever condemned to see the occupation of Palestine through the bourgeois glasses of a religious or ethnic conflict. The first step in the class struggle in the whole of Palestine must be the struggle against Zionism. For this reason is also the one-state solution a first step, so that the Israeli society first learns to put away its privileges, so that the acute problem of the refugees can be solved, so that there is room for the development of a revolutionary consciousness. 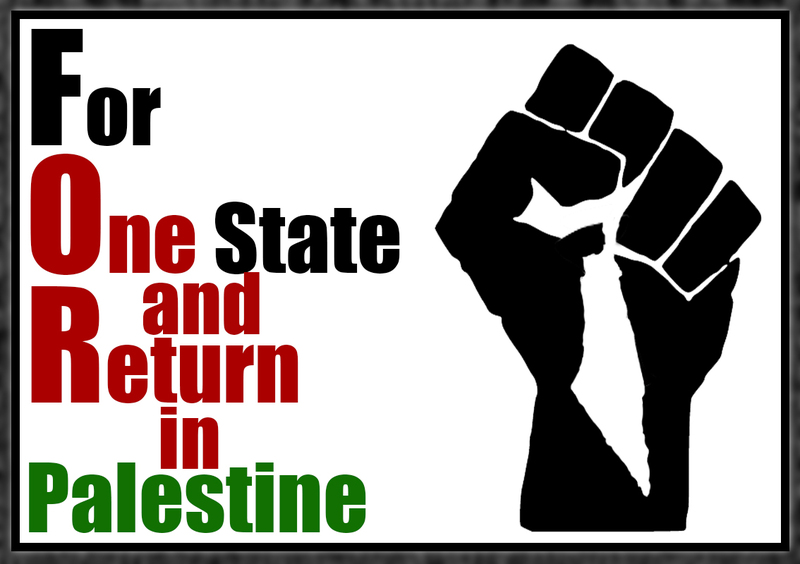 There can be no truly free Palestine without a revolution in the whole “middle east”, but the processes, which bring the consciousness of the people to a state of solidarity, class struggle and equality, begin in Palestine. In the same way that Palestine teaches us resistance for decades, it would also show us the way to the revolution. International solidarity is solidarity with Palestine. This is why we also stand in solidarity with the kurdish liberation struggle. This is why we are also in solidarity with the working class and the workers´ movement in Iran, which is also double oppressed – once by the neoliberal capitalist systems in the country, and once by a dictatorial regime. Long live the international Solidarity!